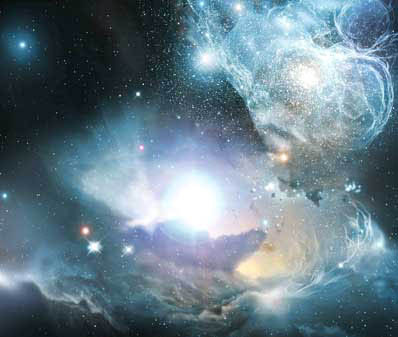 Artist's interpretation of a primordial quasar lighting up surrounding gases about 900 million years after the Big Bang. Source: European Space Agency and Wolfram Freudling, Space Telescope-European Coordinating Facility/European Southern Observatory, Garching, Germany. May 14, 2003 Garching, Germany - The Hubble Space Telescope-European Coordinating Facility and European Southern Observatory in Garching, Germany, near Munich, announced in April 2003 that Hubble has discovered what might be the "ashes" from the first stars in this universe. The powerful telescope found significant iron in the light from primordial quasars only 900 million years old. The theory is that the iron is the residue, the ashes, of first generation stars that formed perhaps as early as 200 million years after the Big Bang and then died in supernova explosions that produced all the iron later recycled into the quasars. According to Wolfram Freudling who led the Hubble research, 200 million years for first star births is much earlier than previously thought.